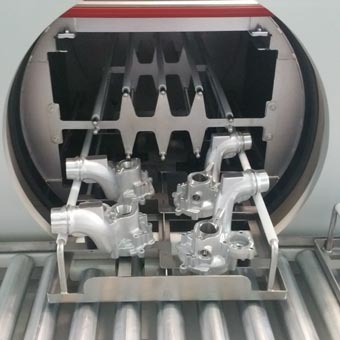 One of the world’s leading manufacturers of aluminium foundry parts for braking systems used in vehicles made by Volkswagen, Daimler and BMW, has now installed two MecWash component cleaning systems in factories that are nearly 8,000 miles apart! Le Belier, who enjoy a worldwide market share of 45% for the aluminium braking components that are made on three continents, has returned to MecWash to ensure components made at the firm’s China plant achieve the same high cleanliness standards already being achieved at their site in Mexico. 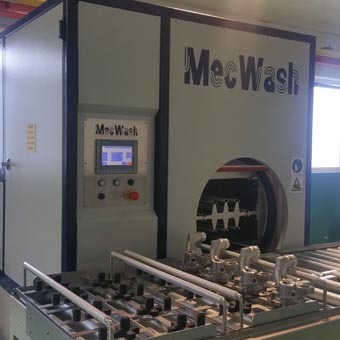 The worldwide company, which has eight other production sites around the globe, first invested in a MecWash system for their factory in Mexico in 2015 and were so pleased with the results that they have now returned to the Tewkesbury-based company to provide a similar solution for the Far East. A MecWash Duo 400 has now been installed at Le Belier’s factory in Dalian, China to help meet increased demand for components which are mainly due to the strong growth of the country’s automobile market that saw 28.03 million cars sold in 2016 alone – an increase of 13.7 per cent on the previous year. The Industrialisation Manager at Le Belier explains: “The aluminium components we manufacture have become a natural choice for the automotive industry because the material is fully recyclable, light and meets the highest environmental and anti-corrosion standards. “As the only manufacturer with production sites in the three main car-making continents, our company is also a preferred provider in response to the globalisation aims of our customers. “That is why we are experiencing increased demand across the globe for our master cylinders and callipers that are used in braking systems by car manufacturers such as Groupe PSA, Europe's second largest automaker, and Volkswagen who, in 2014, sold nearly three million cars in China alone. “We have 10 production sites across the globe and all of them meet the same worldwide manufacturing standards which is why we have invested in a MecWash system again following the successful installation in Mexico which ensured a very low level of rejects was achieved. “The China factory is also manufacturing turbo chargers for the Asian automotive market and this additional output meant we needed to invest in a new cleaning regime to ensure these parts met the highest possible standards. “As a company, Le Bélier is committed to delivering customers perfectly designed and manufactured components in response to an increasing demand for higher quality and all of our plants are accredited to the internationally recognised ISO TS 16949 quality certification system. “At the China factory, compressor housings for use by big name automotive suppliers are manufactured so it is essential that any water-based coolant and aluminium particles are totally removed before the parts can be supplied. “The Duo 400 enables us to ensure all of the housings are completely free of any these particles because of its flood / immersion washing, which provides higher standards of cleaning by full solution contact with all component surfaces, and a re-circulating heated spray rinse, which provides higher standards of surface finish by removing detergent residues left by the wash solution. “This means we meet the highest cleanliness standards possible and we will certainly consider returning to MecWash again when another of our factories needs a component cleaning system installed,” he added. John Pattison, managing director at MecWash, said: “We are always delighted when customers such as Le Belier return to us because it means that our systems are delivering what the company needs and to now have our machines installed in two countries that are nearly 8,000 miles apart is quite an achievement and confirms our global reputation. “The Duo 400 is a natural progression of our popular Solo system and suits both large components and dense baskets of small parts so is ideal for use in the China factory where different sized parts are being manufactured. “Not only does the final wash quality meet the highest possible standards of cleanliness demanded by the automotive industry, but the system is also efficient to operate with an intermediate wash cost and the Duo’s footprint is small enough for a cell. “I am sure the Duo 400 will deliver for Le Belier as the firm continues to service ever-growing demand for its aluminium foundry parts and I hope they will return to us again in the future when they need component cleaning systems at one of their eight other sites,” he added.